Fibromyalgia and Fatigue – There is Hope! Muscles hurt when you exert them; do you ache all over at times? Fatigue haunts you and at times is it like someone’s pulled the plug and drained all the energy out of you? Noticing other health issues, digestive problems, mood swings and brain fog? You are not alone, now more than one in 50 suffer from these syndromes that fall under an alphabet soup of labels, FMS, CFS, ME and PVFS. No matter how you label Fibromyalgia and Chronic Fatigue Syndrome, it is the loss of cellular energy caused by our modern diet, chemical exposure and chronic infections! This loss of cellular vitality takes place throughout the body especially in energy demanding tissues such as muscles, digestive tract and brain. This loss of cellular vitality not only leads to pain and disability, research is now showing rates of earlier mortality from preventable diseases. There is hope, it can be conquered when the underlying metabolic issues are properly identified and treated, he has personally witnessed this hundreds of times, even with his own daughter. The wide variety of symptoms gives witness to the fact that throughout the body and brain, there is not enough energy to properly fun and keep tissues in good repair. This ’gummin-up’ of your cell function (e.g. muscle, nerve, brain) primarily involves chronic inflammation and oxidative stress. Oxidative stress is when free radicals from poor diet and chemical exposure buildup in tissues and cause damage to cells, turning on inflammation. Also drugs prescribed for Fibromyalgia such as Lyrica and Cymbalta cover up symptoms and do nothing to treat the underlying metabolic problems causing the damage. Through proper laboratory testing the source of the systemic inflammation and oxidative stress can be properly identified and treated to conquer this disorder once and for all. 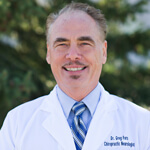 Dr. Greg Fors has been a practicing Chiropractor since 1982.